Novikov. The name sounds so Russian you’d think it would be a Russian restaurant. But jet setters and fine dining adepts have all either been to or at least heard of the famous London based Novikov Asian Room, Italian Room and Lounge, created and owned by Russian restaurateur Arkady Novikov. 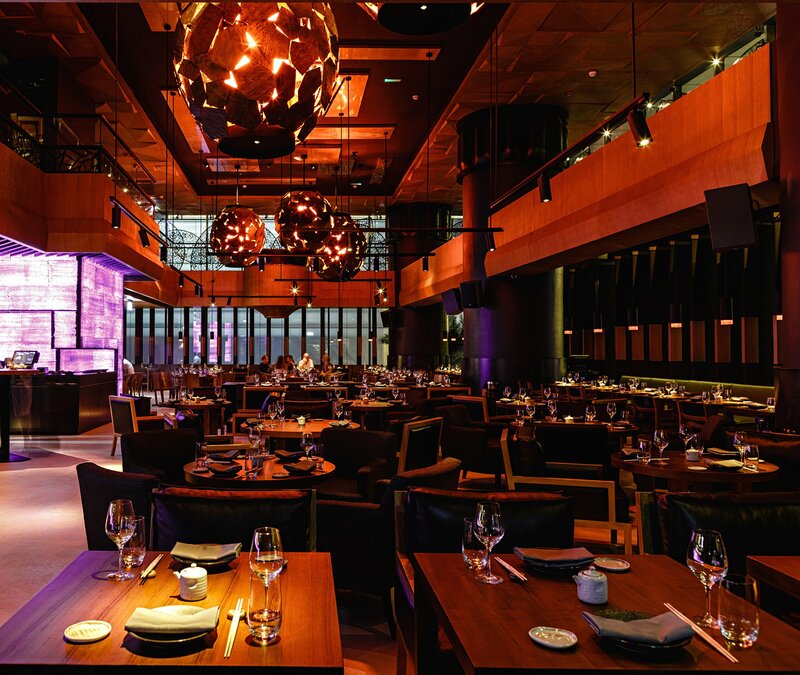 Opened in Dubai by the Bulldozer Group just a couple of weeks ago, this outpost features the pan-asian inspired menu of the London concept in addition to the famous seafood market on display for everyone to admire, and we definitely couldn’t resist trying it out. 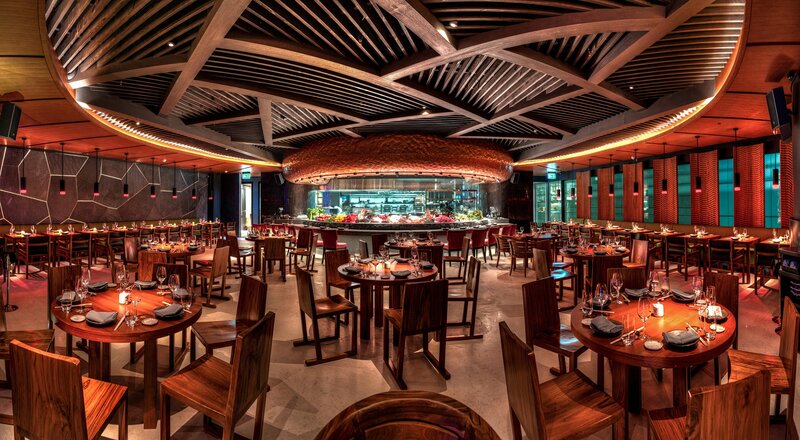 Novikov has its own exterior, private and very spacious entrance next to the doors of the Sheraton Grand off of SZR. After being welcomed by an amicable hostess, we ride up the slow elevator, in anticipation of a new discovery. Brushing off the uneasy feeling caused by the lead hostess’s rather defensive approach to our on-the-spot request for a table in the smoking area, and after admiring the impressive wine cellar, we zigzag between the low tables of the first dining area. 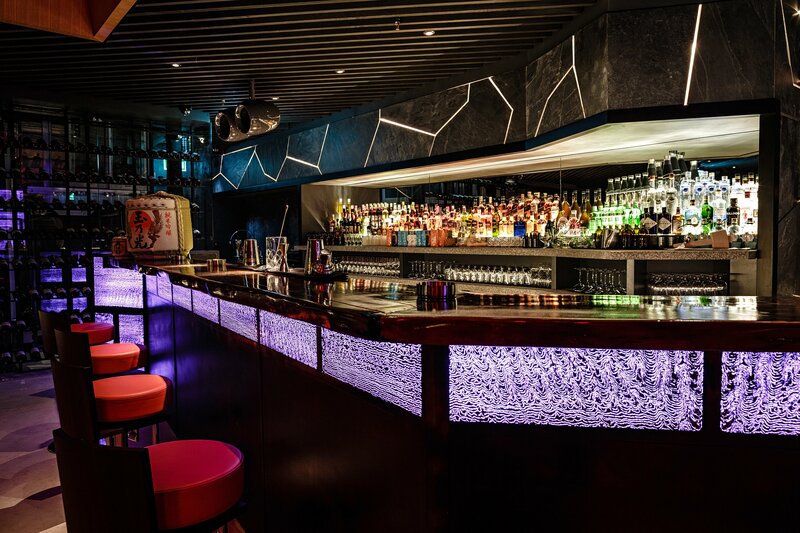 Dimmed lights spotting on the center of each table and lounge music create a cozy, relaxing atmosphere. The decoration has elements reminiscent of its London origins: purple and red lighting, and giant white orchids. The imposing red light globes hanging from the high ceiling look like pieces of art. I follow friendly sommelier Noel’s suggestion and opt for the Alsacian Gentil Hugel 2012, a blend of 5 grapes including my favourites, Riesling and Gewürztraminer. The glass was ok, not the best white I’ve had -not sweet or fruity enough for my liking. My companion, abstaining from alcohol and planning on smoking a H Upmann Royal robusto cigar, asked Noel to surprise him with a good mocktail, and ended up enjoying the chilli passion fruit concoction. The smoking area boasts good ventilation allowing smoke and odours to dissipate quickly. Our starters: the Scallop & Black Truffle Novikov “New Style Sashimi” were perfumed by the perfect amount of truffle and finished with a hint of spice, while the delectable Rose Shrimp & Truffle Nigiri had an overwhelming yet subtle truffle flavour -truffle fans out there will know what I mean. The Peking Duck & Foie Gras maki were very tasty, but some of the duck slices from the middle of the roll were a bit hard. Very well balanced with the foie gras, these roll are as good with the accompanying Hoisin sauce as they are without it. 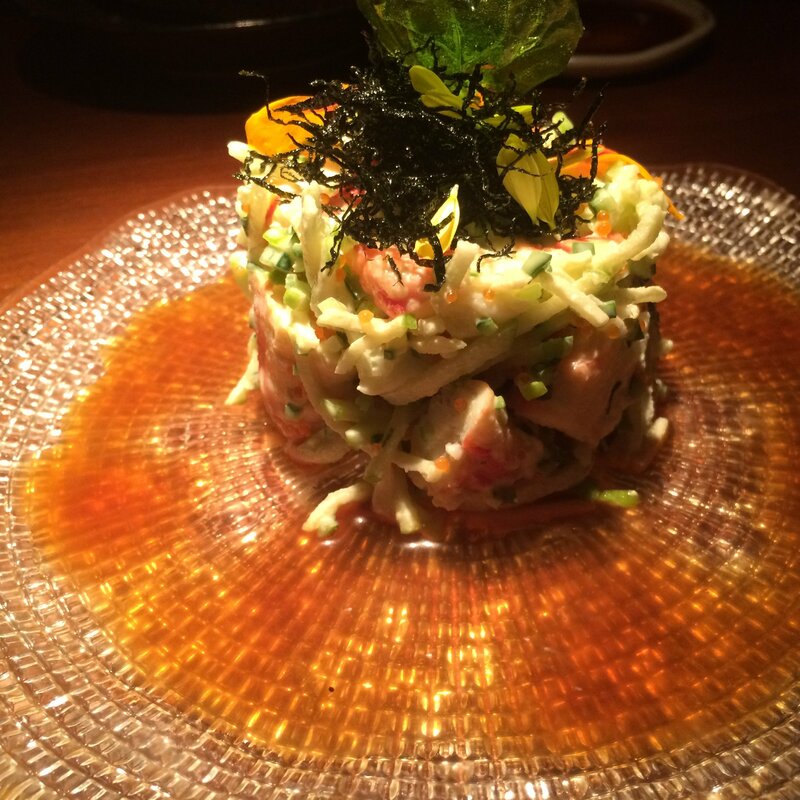 Our Crab, Apple & Wasabi Salad was deliciously refreshing, the sweetness of the apple balancing out the strong wasabi and fresh crab ingredients. The Fried Cod Rolls wrapped in slightly overpowering crispy osmalliyah were enhanced by a delightful mango-mayo, a dip I liked so much I wouldn’t mind having with every other dish. While not practical to eat if on a date (the crispy angel hair tends to stick to the mouth or shatter when bit), these rolls make for a good bar bite if you’re there for drinks, as they are consistent enough to sustain large amounts of alcohol. The basic sashimi slices were the only small let down: the Norwegian Salmon wasn’t as tender as should be and the Japanese Red Snapper was a bit bland. 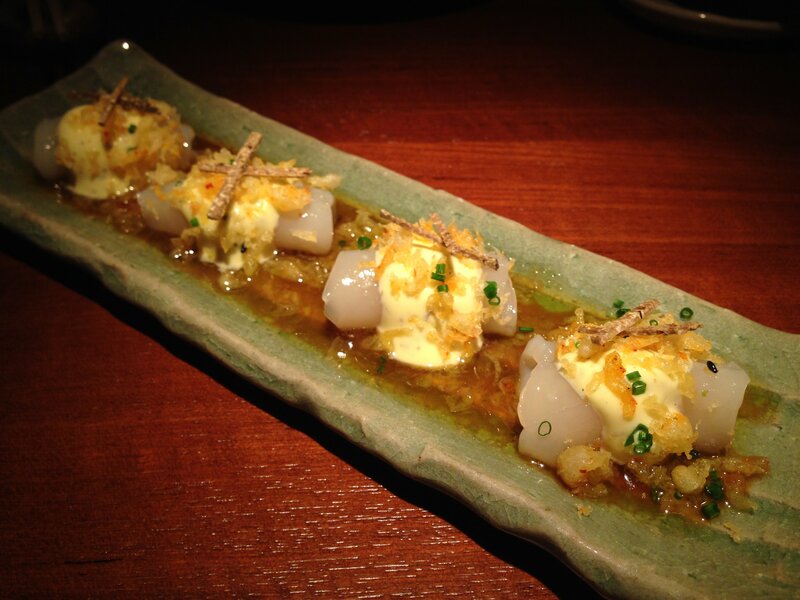 However, the rest of the starters were so enjoyable the minor sashimi hiccup was quickly passed over. Onto the main dishes, and ‘oh my Cod!’!! 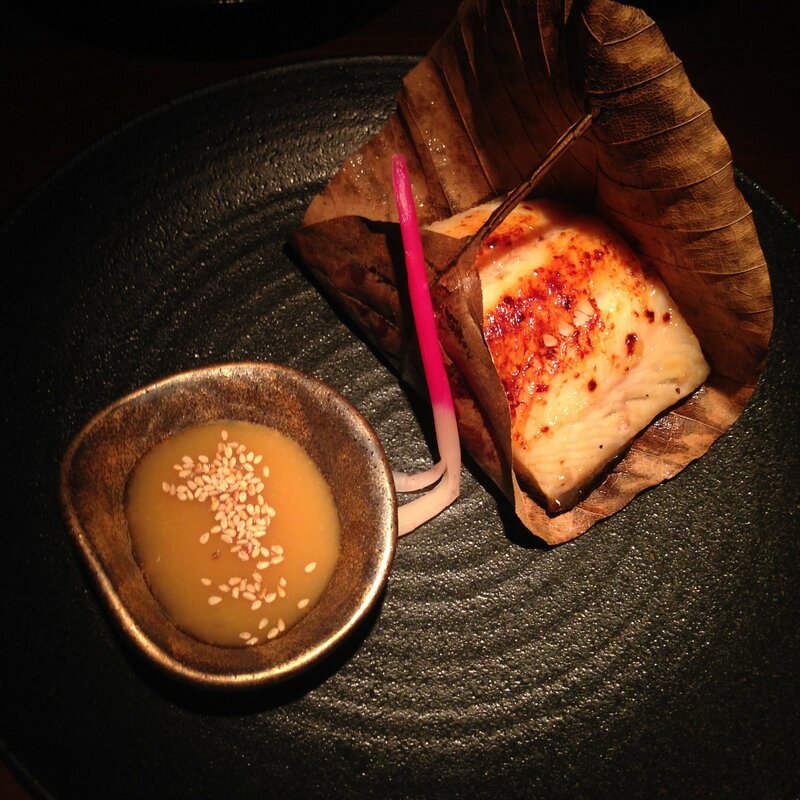 The succulent Novikov Black Cod was almost identical to Zuma’s which has been the best so far in Dubai. Soft, flavoursome and marrying its accompanying dip well, the black cod is definitely a dish I’d have whenever there. 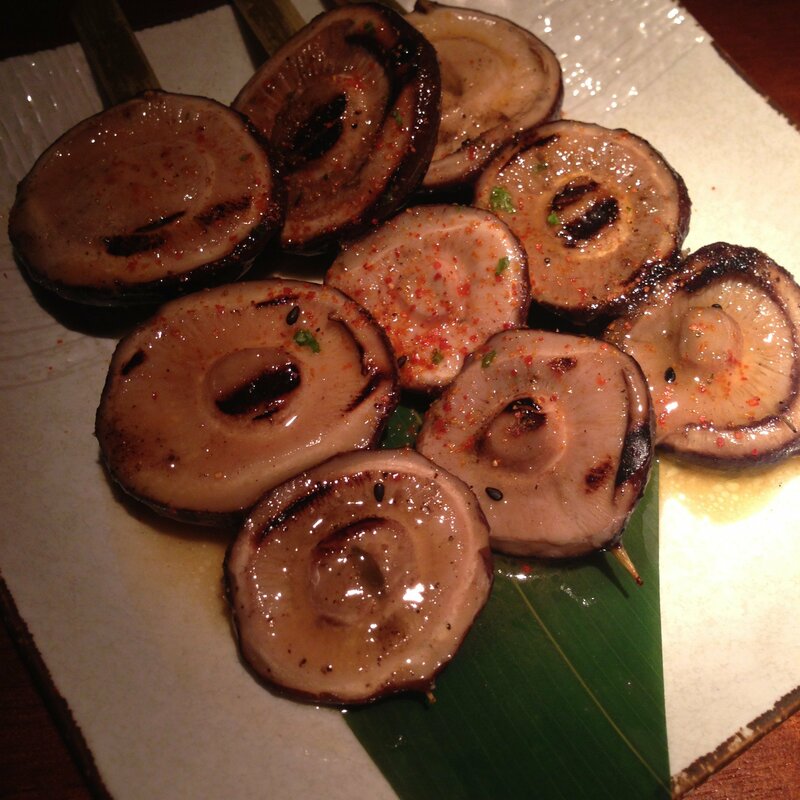 The Grilled Shitake Mushrooms we ordered as a side were quite appetizing and work well as an ‘accompagnement’ with most of the grills. 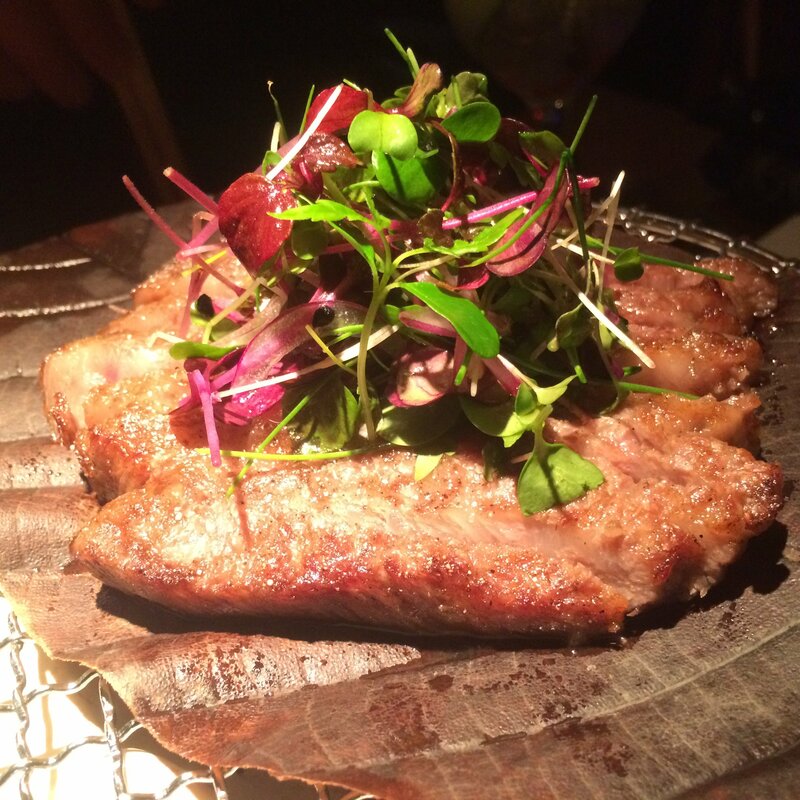 And then came the mouthwatering Japanese Wagyu Rib-Eye Steak! Meat slices so tender they melt in the mouth within seconds, so delicious you won’t be able to stop. Drop the sauce; the meat itself is so juicy and flavourful it shouldn’t be altered by any other ingredient. The kitchen seeming to be spot on with the cooking degree, I’d recommend it medium-rare for the real carnivores out there. The dish is so successful it’s worth its steep AED650! Although full by the end of our mains -as usual!- we had to try some of the desserts. The Profiteroles Tokyo Style, a surprise by our friendly and helpful waiter Yuri, seemed to be a light version of the French profiteroles we’re used to: the pastry is filled with Calpis, Shisho and Raspberry sorbets and topped with white chocolate sauce. Fresh if you’d like to cool down your palate after the meal, it wasn’t sweet enough for us. 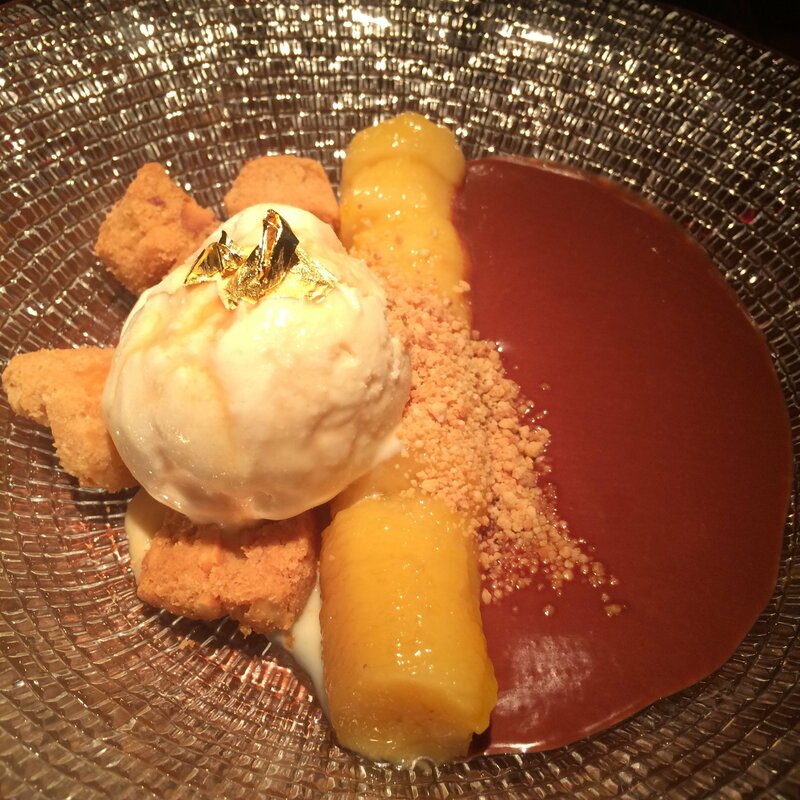 So we went on to try the Miso Banoffee V2, a rich -even in its look and ingredients- arrangement of poached banana in saffron syrup, miso caramel ice-cream, peanut butter crumble and warm Manjari chocolate mousse: yummy! Need I say more? Just as we were about to finish our meal, between 9:30 and 9:45pm, the lights were dimmed and the lounge music picked up its pace: warming up for a club atmosphere? 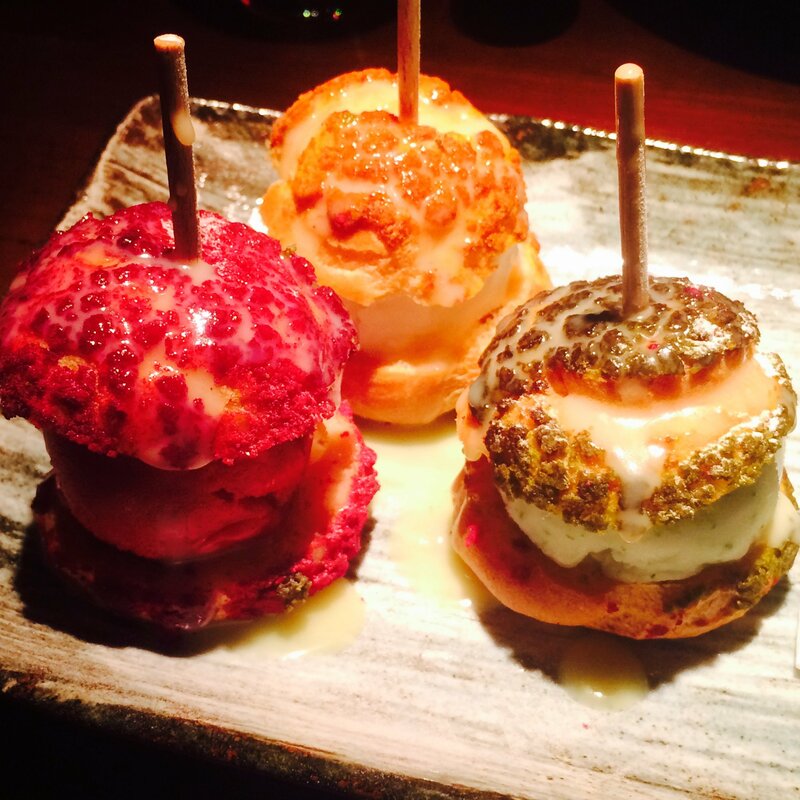 We wonder… Will Novikov be the next ‘It’ place in Dubai? Note: Since lights were dim, photos were taken on iPhone in ambient lighting. Restaurant images provided by Novikov. Asia Asia Leads The Spice Route To Dubai. Next Post Hublot Scores Big Again In Football!